In 2007 the Friends of the Wanamaker Organ received exciting news of the generous gift of a Wurlitzer pipe organ from the Smithsonian Institution. It is being installed in Greek Hall through the courtesy of the Smithsonian and Brantley A. Duddy. Dedicated private funding is coming from the American Theatre Organ Society, the Arcadia Foundation, Macy’s and several public-spirited individuals. All this was brought to reality through the tireless energies of Wanamaker Organ curator Curt Mangel. The Friends of the Wanamaker Organ thanks all those who are bringing this wonderful instrument to Philadelphia—and particularly the board and membership of the American Theatre Organ Society for their passion, guidance and vision. Greek Hall and Egyptian Hall were the main auditoriums in the Wanamaker Store. 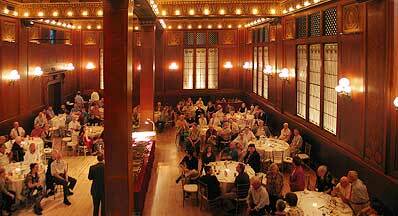 By 1908, both halls contained Austin pipe organs. The Greek Hall Austin was of the Chorophone design and was later given by Rodman Wanamaker to Philadelphia’s Baptist Home (now Deer Meadows). 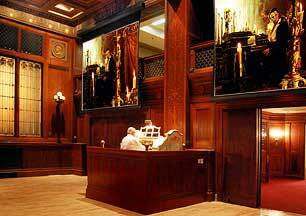 It was placed in a Chapel Mr. Wanamaker built in 1928 that was actually designed around the organ. 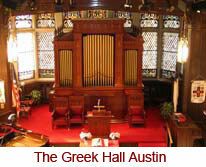 The Greek Hall Austin has beautiful marquetry that matches the inlaid paneling of Greek Hall. 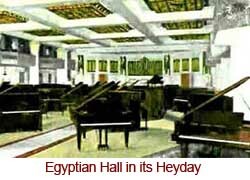 The Egyptian Hall Austin had four manuals and was removed around 1938. Egyptian Hall now houses the Administrative Offices and the Dickens’ Christmas Village, while Greek Hall continues in its original role as a special-purpose hall. Lowell Ayars, onetime owner of what is now the Friends of the Wanamaker Organ Wurlitzer, had long been known in theatre-organ circles as the “Singing Organist.” He played many conventions for the American Theatre Organ Society. His Ayars’ house in Bridgeton, N.J., underwent a transformation when he purchased the Wurlitzer. The side-porch roof was shored up, a pit was dug down to basement level, and well insulated walls were built up to the porch roof, which then became the ceiling of the organ chamber. Opus 2070 had been a single-chamber installation in the Fox (Rio) Theatre in Appleton Wis., and it was again set up as a single chamber. One set of shades was affixed to a window in the living room. Volume was not excruciating, because the organ was approximately 3 feet below first-floor level, and the shades were well above the pipework. A bookcase (fully loaded) acted as the living room screen and volume control. I tuned the instrument a few times for Lowell. The amazing story concerning this organ is that nothing was ever altered. It was Lowell’s hope and desire that the instrument be preserved in its original condition, and he made every effort to keep it that way. About a year before his death we had a discussion about what would happen to the organ. I expressed a desire to find a home for it where it would be appreciated. Little did I know that he would bequeath the instrument to me with no strings attached. His executrix Dana Fekel and I exchanged ideas in the “what if” category. What if we could get the Smithsonian Institution interested? So, with the aid of Richard Neideigh, we began the process of invading the Washington bureaucracy. Brian Jensen from the Smithsonian made an inspection of the instrument and stated that it was “the instrument we were looking for, to add to our musical instrument collection.” Subsequently, several of us made the pilgrimage to Bridgeton to dismantle it and ship it to Washington. Carmichael Auditorium was to have been the home of the Wurlitzer. Chamber drawings were made, and a sliding platform was built, not unlike Radio City, to store the console to the right side of the stage. A window was to have been cut in the foyer to show off the console in the picture setting of a theatre stage. Jack Bethards, Jim Weaver (the head curator)and I met in Carmichael and got the whole layout set up. That was when ATOS was approached to assist in funding. A private grant had followed the instrument to Washington. It funded moving costs and architectural renderings, plus some limited leather purchases for our restoration procedures. The whole idea was to make the instrument historically accurate, warts and all. Glenn Thompson and I made several trips to the Museum of American History to work on the chestwork and relay in an area behind the Presidential Ladies’ Gowns. Gradually we were pushed into smaller and smaller quarters, and finally we heard that the organ was “going into storage.” Many chest primary pneumatics, power pneumatics, pallet facings, reservoirs, and other small pieces had already been completed when we were forced “out of business.” That was back in 1996. Nothing ever saw the light of day. After waiting with no news until the fall of 2006, and knowing the museum building was being retrofitted for new displays—excluding the organ—I contacted Gary Sturm, the new head of the musical-instrument division. Correspondence then went to the new museum director. With Gary’s mentoring, the rest is history. The Wurlitzer was delivered to the Wanamaker Building in the spring of 2007 and restoration began soon after. We look forward to having the first Theatre Organ to play in the Philadelphia city limits since 1968, when the Boyd Kimball left Philadelphia for Wilmington, Del., to reside at John Dickinson High School. Our heartfelt thanks go to Brant Duddy for his tireless work on behalf of this theatre organ and so many other fine instruments in our community and nation. Brant Duddy is a man of passion and commitment. So many of the sounds music lovers enjoy are due to his tireless and selfless dedication to the King of Instruments. Wurlitzer costs are funded by designated gifts to the Friends from interested parties and do not come from regular Friends giving, which is directed exclusively toward the Wanamaker Organ.